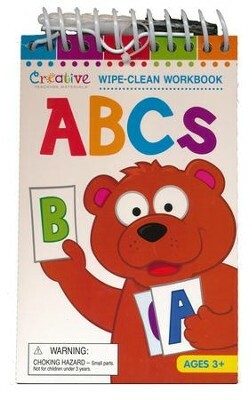 ABCS: Wipe-Clean Notebook is a pocket-sized reusable workbook to help kids learn their alphabet! Students will trace and practice printing both upper and lower-case letters on write-on/wipe-off pages. Activity pages are also included where students can match upper and lower-case letters and match letters to items that begin with the same letter. 22 pages with pen. Flip-top spiralbound. 4.25" L x 7.25" H.
I'm the author/artist and I want to review ABCs Wipe-Clean Workbook with Marker.